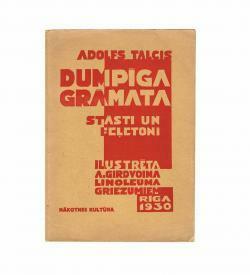 TALCIS, Adolfs: Dumpīga grāmata. Stasti un feletoni [The Rebellious Book. Stories and Feuilletons]. 18 plates with lino-cut illustrations and presumably also typographic lino-cut cover design by Adolfs Girdvoins. Rīga: 1931. 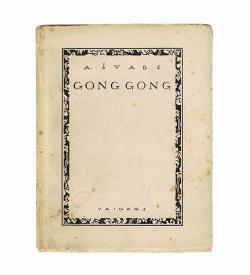 ŠVĀBE, Arveds: Gong-Gong. Tankas. Cover design and 15 full-paged illustrations based on ink drawings by Sigismunds Vidbergs. Rīga: Vaiņags 1922.